The last few years at WebProof have been an incredible journey. In fact, our community now reaches over 50,000 strong. 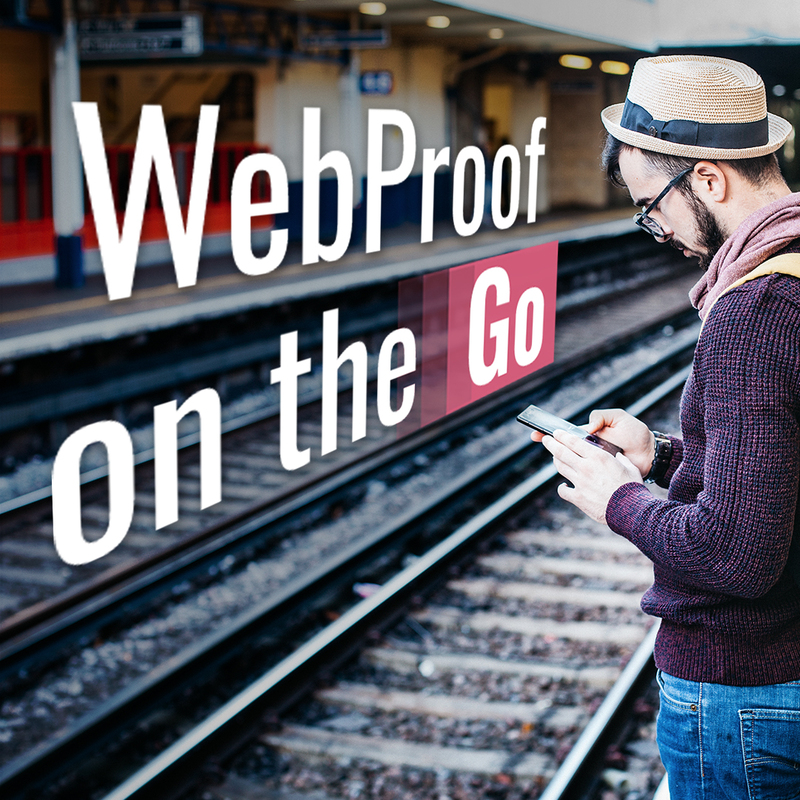 In that time, our most frequent request has been to release a mobile version of WebProof for proofing on iOS devices. You said you needed something more flexible, more versatile, and more adaptable—and you were right! We know that creativity doesn’t always strike when you’re sitting in front of the computer. More often than not, your lightbulb moment comes when your mind is on something else. Even Einstein said his best ideas would come to him while he washed the dishes. So what do you do if you’re out and about, and you come up with a new change to make to your project? Until now, you’d have to scribble it down somewhere and wait until you got back to your desk to put it into WebProof. When you’re working on a team project, the headaches only multiply. Nobody wants their business trip to turn into a nightmare because they’re out of reach. What if your team is waiting for your feedback to complete a rush project? And what happens when you finally meet up with this new client? Maybe you’re in a coffee shop talking over some design ideas. You don’t want to carry a bunch of notes and printouts around. Nor do you want to wait until you’re back at your desk to put them in WebProof. As designers, marketers, editors, and managers, we know this would hold us back. It’s too much hassle for us and our team. The perfect iOS proofing tool is one that’s as flexible and fluid as the people who use it. Luckily, our team has finally got a solution for you. Our iOS Proofing Tool is a Powerful, Portable Tool that Lets You Comment, Review, and Communicate with Your Team from Anywhere. It’s the perfect companion for busy teams that need a versatile tool to manage their design workflow. Magazines, products, ads, newsletters—no matter what you’re making, our app will help you do it better. Imagine what you could achieve if you could connect, track, and manage your projects from anywhere—whether you’re on the train, at a coffee shop, or on a business trip. You’d never be out of touch again. Leaving feedback becomes hassle-free with the built-in sticky notes, highlights, and markup features. Point out edits or new ideas so your team can make it happen fast. Better yet, there’s no room left for error when you leave detailed notes. And say goodbye to those “pull your hair out” moments when you thought you’d lost your work. The history feature in the proofing tool automatically logs every detail. You don’t even have to think about it. It saves every change. It’s all there, always, anytime you need it. With WebProof iOS Proofing software, the power is in the palm of your hand. Your Laptop/Mobile + WebProof + WiFi = Total freedom to manage your team and create great work anytime you like! Designed to Make Your Projects More Productive, Efficient, and Effective. Unlike a mobile website, we built our iOS app from the ground up using WebProof’s latest API. It’s more than our web-app squished into a smaller screen. It’s a mobile-optimized experience with a fresh new look. And you’ll still have access to all the most popular features of our desktop version. Note ideas, share comments, or check in on your project with a few taps on your smartphone. Update the status of a page so your team knows whether it’s approved or needs revisions. They’ll get notified right away, so they can make the changes fast. Structure your projects into folders with multiple levels to stay organized. Get a bird’s eye view of your project status or zoom in on a single page to leave a comment or approve a design or a text. Pinpoint exact areas for improvement with the Box Markup feature so there’s no room left for error. Highlight any text you’d like changed, and WebProof will transfer it into a sticky note, which means less work for you. Track and backup every detail using document history and smart status codes. Get live updates from your team anytime without feeling like you’re annoying them. It’s easy to get started with WebProof. Just upload project pages to the software via a Windows PC/Mac browser or an InDesign/Illustrator plug-in. Then you’re ready to go. For the last 10 years, brands like H&M, VW, ICA, Toys”R”Us, and Audi have trusted us to make their teams more effective. Our users have logged in nearly one million times to use WebProof to improve their projects. And a staggering 100 million pages were flipped, viewed, and reviewed. Out of those, five million designs got approved by world-class teams. There’s a reason why great brands trust WebProof to help them create high-quality work faster, and easier. Try WebProof for FREE and find out how you can use it to take your team to the next level. And don’t forget, you can be one of the first to try our brand-new iOS proofing app right now. See more WebProof’s iOS version features here. Previous PostThis Online Catalog Proofing App Helped Santa Avoid a Christmas CatastropheNext PostBoost Your Productivity With WebProof’s Adobe Illustrator Plug-in.